OK, that’s not what its really called. Its really called part of the Ganaraska Hiking Trail (GHT) that runs through the doctor’s property. Ranger and I just like calling it The Good Doctor’s Trail because Dr. Harris is one of the few private land owners who allows the GHT to mark a trail across his property. I have never written a review of it, as I believed I was doing him a service by keeping it quiet. But then, I suppose a blog entitled “2 Old Guys Walking” isn’t gonna be read by ATVers, nor high school kids looking for a party place in the woods. And then of course, there’s the doctor, and the pride he takes in his trail. When we see him walking or cycling the roadside, he always asks “Have you walked the trail recently ?” So, here we go. As always, the best trails are the hardest to find, and this one is no exception. It’s surprisingly near the now ruined Sylvan Glen Conservation Area. The “No Motorized Vehicles” sign at Sylvan Glen might as well have been posted on the 401. The trail is an impassable quagmire of muck, compliments of those A-holes. Alright, enough mud-raking on my part. You can leave your car at the Sylvan Glen parking lot (since the rest of it is useless to anyone … OK! OK, I already ragged on that). From there you can cross the bridge and look to your left. You’ll see an opening in the fence. Just follow the white rectangles on the trees. There’s a small downhill walk but once at river level, the trail wanders along beside the Ganaraska for the entirety of the doctor’s property. I won’t suggest you start from the other end of the trail as it’s VERY difficult to describe how to find it. Once you walk it, you’ll know what I mean. This trail is all about the sights and sounds. Particularly the sounds. While the views of the river are pleasing, the combination of running water sounds and the noisiest forest I’ve ever experienced make this one of my favourite walks. With the slightest breeze, the dense cedar forest literally howls, squeaks, and squawks. The upper branches behind the bench tangle together in the wind, clattering as the breeze shifts, squeaking and squawking as their trunks rub together. The sound can be a little disturbing as it’s kinda creepy on occasion. Turn your sound up for the video below. The best stuff starts about 20 seconds in. In season, you will witness the spawning habits of huge rainbow trout from only a few feet away. The shallow, broad river is thick with them. There are beaver in a small tributary passing through the property. *** UPDATE October 8, 2016 – the wife and I walked this trail two days ago, and were treated to a flyby of a huge immature Bald Eagle scavenging dead salmon in the Ganaraska riverbed***There are sections of mixed forest, cedar lowlands, open meadows, and of course the trail is mostly a riparian ecosystem. 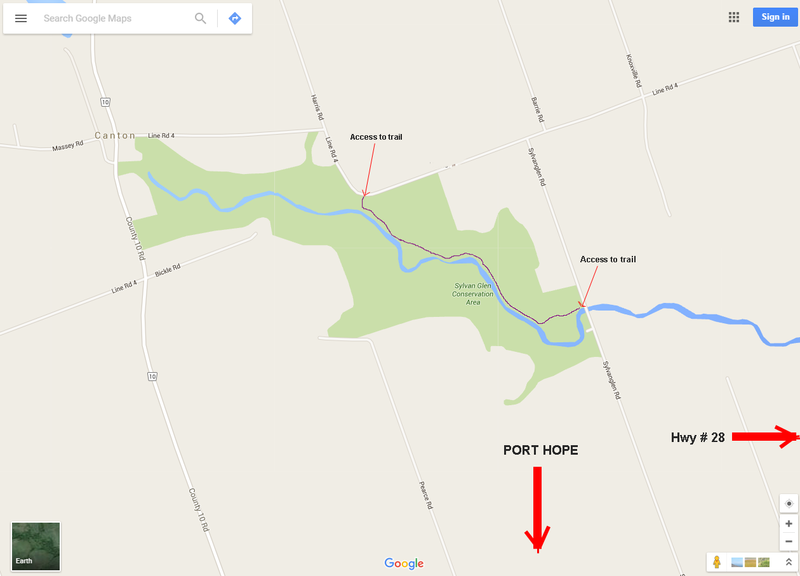 You can make a “loop” out of this trail by walking the 4th line and Sylvan Glen Rd. While I would normally suggest you walk the trail back, rather than walk roads, I must admit to kinda liking the walk on the roads myself. You can try both, and see what you think. It’s about a 2.6 km walk either way.